Business has changed so much since 1985, when I started my first company! It isn’t just the technological advances which have dramatically changed how we do business. (My first piece of technology was an answering machine.) It is also the business models—subscription and online—and more recently, the emerging ‘gig economy’. The gig economy is enormously appealing and exciting for many people. You get to choose: with whom you work, where you work, and when you work. It’s social, the hours are flexible and the pay is greatly appreciated. For many, it is a lifestyle choice. Need an example? Think of new businesses such as Uber and AirBnB. …40% of the US workforce is now working in the gig economy, up from 31% in 2005. According to an article in Forbes, Gig Economy: Better for boomers than millennials, the gig economy is growing at a rapid rate. For example, 40% of the US workforce is now working in the gig economy, up from 31% in 2005. The gig economy or the ‘sharing economy’ is not just for millennials, however. It is also attractive to the baby boomers as a means to either top up their salary job or to boost their retirement savings. The gig economy is significantly affecting businesses’ brands. In this type of economy, brands rest in the hands of the users and the ‘freelancers’ who deliver the goods and services. With this in mind, businesses need to review their brand touch points at every stage of the journey as well as building a community of brand ambassadors (those who deliver the services). The way HR, training, and remuneration operate will also need to change so that they align with this not so new way of doing business. What opportunities are there for your brand to embrace and grow in this gig economy? *Christine Moody is one of Australia’s leading brand strategists and the founder brand management consultancy, Brand Audits. With more than 30 years’ professional experience, Christine has helped a diverse client base of local and international brands, including Gold Coast City Council, Hilton Hotels, and Wrigleys USA, to develop, protect and achieve brand differentiation. Her particular interest is personal brand audits to assist executives realise their full potential. 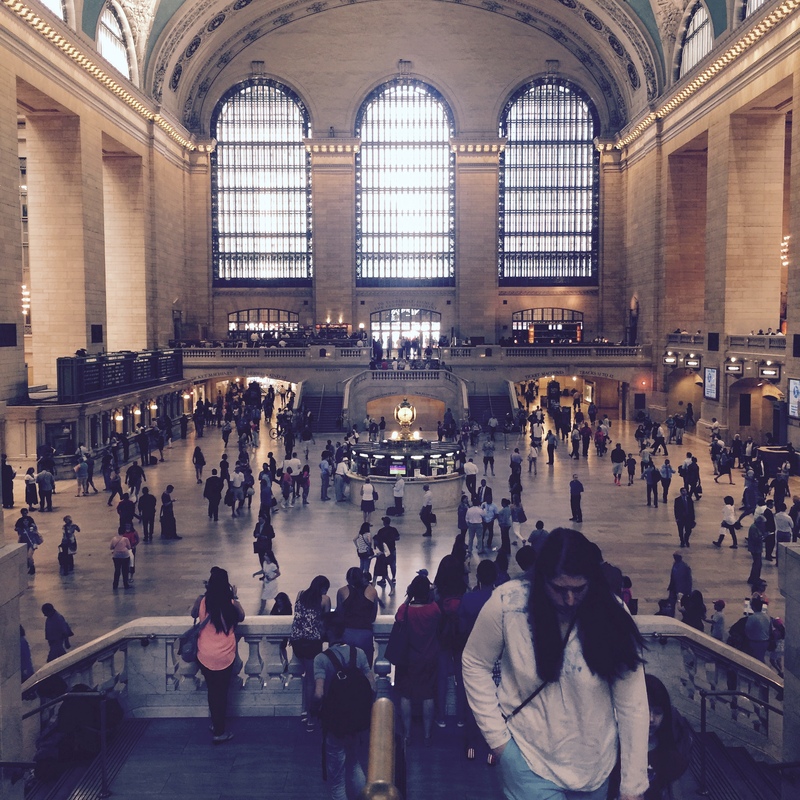 Photo credit: Christine Moody @ Grand Central Station NYC 2015. Everyone seems to be talking about ‘Innovation‘. Australia even has a policy—and dedicated website—around innovation and the ‘Ideas Boom‘. Professional Australian organisations are also talking about innovation. For example the Australian Institute of Company Directors (AICD) current edition of Company Director magazine features an article titled: ‘Embedding Innovation’. If you have been in business for any length of time you know that innovation is not new, but it is crucial to business survival. There are many examples of successful companies with a history of innovating. Star-brands such as Apple and Nike have strategic plans around innovation because they understand it is central to their brand differentiation and survival in a highly competitive and fast-changing market. Unlike the current hype around innovation in Australia, organisations like Apple and Nike, Just Do It! They embed the processes in the organisation and make it part of the brand’s DNA and therefore their strategy. It’s no accident that organisations with innovative policies are more successful or that innovation is part of their way of doing business. In my experience, embedding innovation needs to start with the CEO and Board. They need to understand what innovation is and how to apply it in the commercial sense. “We need to identify what we mean by innovation because most people seem to think that it is about product or service innovation. Increasingly, innovation is moving to various forms of intangibles—and not just patents, copyright and trademarks. A new business model, for example, is extraordinarily innovative. Going digital is innovative. So the first thing to look at is what is meant my innovation and extending this Board’s horizon,” says Neville Christie, CEO New Enterprise Services (as quoted in the AICD article referred to earlier). We need to identify what we mean by innovation because most people seem to think that it is about product or service innovation. I have been going to countless private, public, and education forums, seminars and workshops around innovation. I am noticing one thing: we are hearing about innovation, we are reading about innovation, but what are we doing about innovation? It feels like everyone in Australia is talking about innovation, but very few people are doing something. I want to see some action and some results. Innovation to me means new ideas and new ways of doing old things. It is about connecting the dots. I reckon that coming up with ideas is the easy bit. The hard bit is executing it! We aren’t seeing a lot of this, and I wonder if we are all a little bit scared? Any innovative idea is scary because you have to put yourself ‘out there’ and talk to people who may not ‘get it’. You have to address your fear of failure. I know I am onto a new idea when I get the blank ‘eye glaze’ from people when I am in the early stages of development. For me, this is a litmus test for innovation. If someone gets your idea and you don’t have to explain it much, then it is too safe and not innovative. To progress an innovative idea, you need to translate it into a prototype quickly. This ‘proof of concept’ stage is scary, but its important so that you can ‘show and tell’ and get valuable feedback. I developed a quick ‘idea to prototype’ strategy after a trip to Stanford University’s d.School. In July 2011, I returned from their one-week intensive at Executive Education ‘Design Thinking’ Bootcamp. I realised I had to prove that the process we were immersed in actually worked in practice. So on the way home from the airport, I dropped into an office supply shop to collect items for a prototyping kit. My kit included brightly coloured pipe cleaners, post-it notes, pens, pencils, paper, cardboard and ice block sticks—just like the stuff you see at kindergartens! The idea is to use these inexpensive items to create a rough prototype that you can see and touch. It helps to explain your idea to others and test the idea with your users, iterate, and then test again. It is an important step in the ‘design thinking’ process because it enables you to quickly create inexpensive prototypes before you develop the final designs, create detailed drawings, and order samples etc. I gave myself seven days to complete my prototype with no significant expenditure. The result was an idea for ‘Poppy Cakes—A Party in a Box’, which went on to win Business Review Weekly’s ‘Best Creative Business Idea’. My innovative idea took less than one week and no money to create—except for stocking my prototyping kit, which I could continue to use to brainstorm a range of new ideas. The idea behind it was an observation—via social media and talking with customers—that a cake may be central to a celebration, but it is stressful organising the party and gathering the other items such as cups, plates, serviettes, tablecloth, and candles. ‘Party in a Box’ arrives at your door with the cake and everything you need. An added bonus is that it is 100% recyclable, which means rubbish can go back in the box and into the recycle bin at the end of the party. I would love to hear what processes your organisation uses for developing new ideas and stories of successful innovative ideas that have been created and launched! 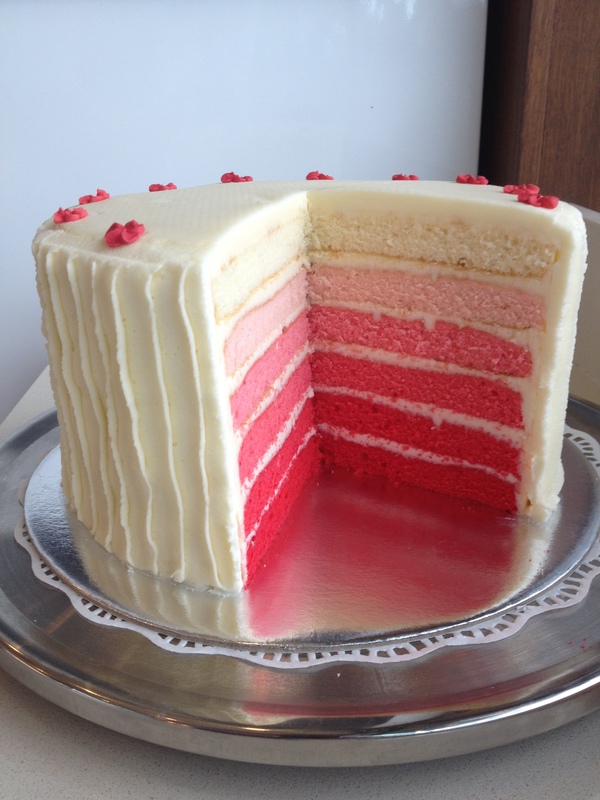 Photo credit: Poppy Cakes ombre-layered cake. 2015 Telstra Business Woman of the Year Award recipient, Dr Catherine Ball captivated the audience at a recent Women in Finance event. As the keynote speaker, Catherine told us about her personal struggles and how, with ‘a little help from her friends’, she got to where she is today. I have heard Catherine speak many times—even the day before this event. This presentation was different. It was so engaging and it got me thinking: we all need a little help from our friends, whether it’sto realise our personal or business challenges. For Catherine, it was the friend who gave her a couch to sleep on or the friend who encouraged her to pursue her dreams, even when she felt like giving up. Sometimes, it was as simple as phoning someone when she needed help. Throughout my career, I have had a lot of help from my friends. I have benefitted from having friends who are trusted advisors and who have given me the guidance that I needed. I’ve always known I wasn’t alone. Some people know they have helped me, but others don’t. Seeking ‘a little help from friends’ is what every person and every business needs. However, in business, I think we sometimes forget to seek out—and accept—help from our friends. Seeking ‘a little help from friends’ is what every person and every business needs. Friends are trusted advisors. Whether they are on the inside or outside of your business, they will be there for you and help your organisation’s brand. They are the ones who stick with you through thick and thin. They are not afraid to tell you what they think—even if it risks the friendship. Having experienced first-hand the importance of the right advice and guidance from ‘friends’, I knew I needed to give back a ‘little help’ to other designers. So I launched Designer Law School. Designer Law School is an online education program, which highlights the basics of the law as it affects designers.It’s also a forum where designers can feel like they are talking to a friend who ‘gets it’ and sees all problems visually. Hopefully, designers will feel they are not struggling by themselves. In both our business and personal lives, true friends who will help are few and far between. They are gems that we need to look after. 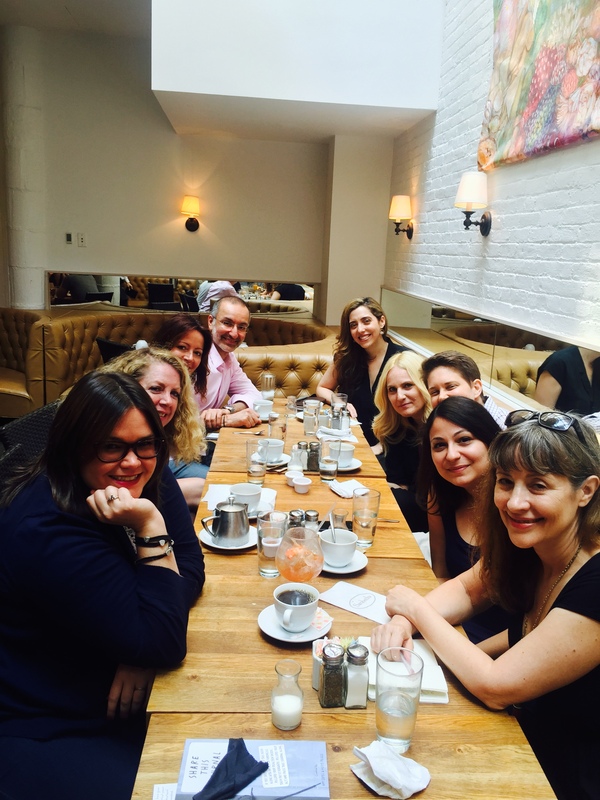 Photo credit: Brunch at Sarabeth’s NYC, which was organised by Author and Speaker, Dorie Clark (By Christine Moody, NYC, 2015).